A dishwasher is a kitchen appliance that is connected to the hot water supply in your home, and uses rotating water spraying arms to wash away food and grease from your dishes, pots, pans, and silverware. A dishwasher will typically have a water heater as part of it that will raise the temperature of the inlet hot water supply even higher, so that it helps the unit clean more effectively. And some models will have multiple settings, which can allow you to save energy by allowing the dishes to air dry, rather than using a heating element in the appliance. 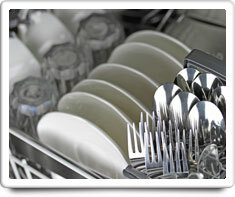 Any obstruction of the water's flow greatly reduces the dishwasher's washing efficiency. Shown in the 'Routine Care' section are the recommended routine maintenance tasks for your dishwasher. The 'Q & A' section shows answers to common questions. And the 'Articles' section provides helpful articles about your dishwasher.